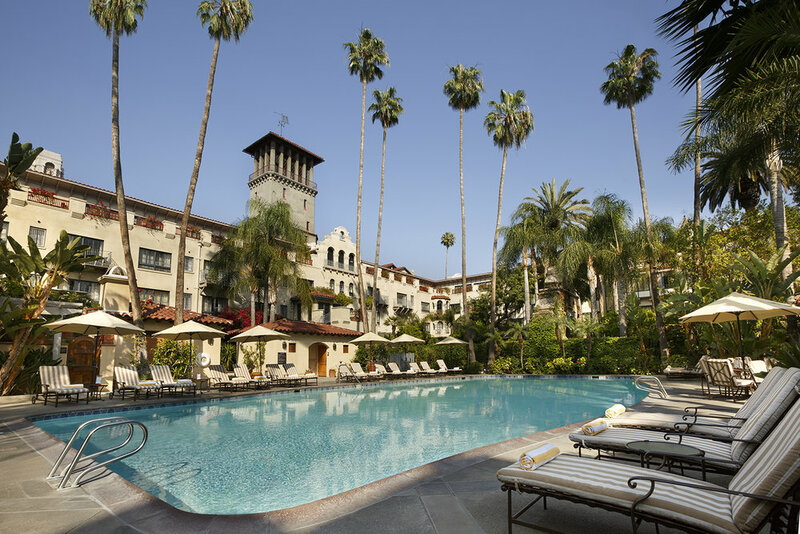 The historic Mission Inn Hotel & Spa in Riverside, CA, dates back to the late 1800s. Featuring stunning Spanish mission-style architecture, The Mission Inn Hotel & Spa in Riverside, CA, provides guests with a destination where rich history and classic elegance exist in perfect balance with contemporary luxury and comfort. It is also home to Kelly's Spa, which is ranked among the top spas in the country. The spa's director, Jodi Brown, gives us a peek inside the hotel's glamorous spa, which relaxes visitors via the serene ambiance of an ancient Tuscan wellness oasis. Why You’ll Love It: Adding to the uniquely vibrant and colorful history of The Mission Inn Hotel & Spa, Kelly’s Spa provides the ultimate sanctuary with an oasis of luxury amenities and Old World-inspired treatments focused on heightening each guest's sense of relaxation and wellbeing. Whatever your preference of treatment, Kelly’s Spa is the perfect destination for restoring personal balance or simply treating yourself to a little pampering. The hotel and spa boasts a year-round outdoor pool and spa center. Key Features: With a Tuscan-inspired ambiance, our lavish 7,000-square-foot spa features 12 treatment rooms, including two beautifully appointed private villas that can be used for couples, brides-to-be, and groups of friends; two bath suites; a nail salon; gender-separated retreats with eucalyptus steam rooms; two relaxation lounges; and an outdoor swimming pool and whirlpool. Bonus: Upon arrival, each guest is served a complimentary glass of one of our four fresh juice blends prepared daily by our chefs, or a glass of champagne and a chocolate truffle. 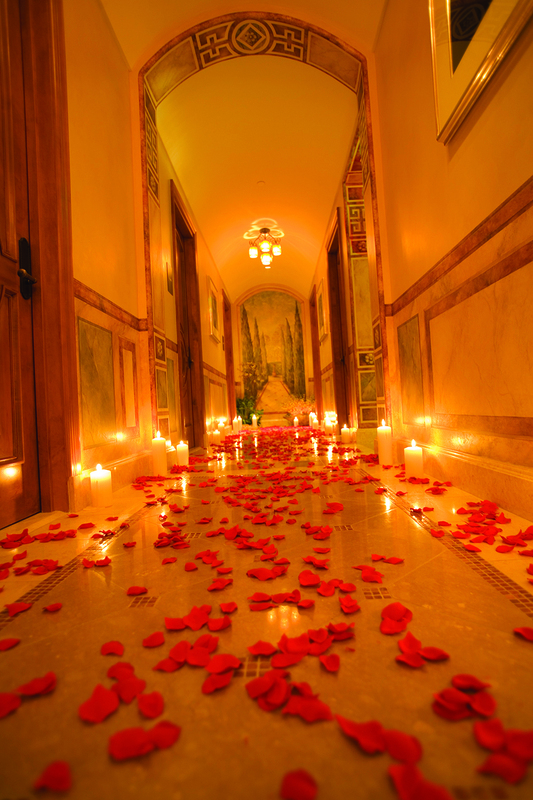 The candlelit hallway leads guests on their spa journey. Insider Tip: If you share with us that it's your birthday or anniversary, we offer complimentary chocolate-covered strawberries! Snacks Served: We also offer complimentary fresh fruit and almonds, along with our Kelly’s Signature Teas in both relaxation lounges. The spa has two private villas that can be used for couples treatments. Splurge: If you would like to escape your world and indulge in ours, I recommend “The Art of Relaxation Package.” Reward yourself by taking time to indulge in this beautifully decadent example of living "La Dolce Vita." This package includes a 50-minute custom facial, an 80-minute Swedish massage, and a luxurious rose petal bath followed with a glass of champagne and chocolate-covered strawberries. Kelly's Spa employs natural products, unique treatments and specialized programs to enhance wellness. Most Unique Treatment: Our most unique treatment is our “Kelly’s Fountain of Youth Signature Body Treatment.” This signature experience takes your mind and body on a journey to relaxation by blending select services into one package. Your experience begins with an antioxidant hydrotherapy bath, our exfoliating Garden of Eden body polish, and a Swedish massage utilizing warm grapeseed oil. For the finale, achieve a state of mental clarity with our temple tension release as your hands and feet are renewed with a paraffin treatment. The Mission Inn Hotel & Spa is the Inland Empire's only AAA Four Diamond hotel. Insider Favorite: My personal favorite treatment is our “Hollywood Glow Oxygen Facial.” You will feel like the celebrity that you are with this unique experience which provides instant results. As gentle and relaxing as a breeze off the Italian Alps, this treatment is ideal for all skin types. Our rejuvenation serum stimulates regeneration of new cells, elastin and collagen, and is infused with vitamins A, C and E, as well as hyaluronic acid to saturate your skin with nutrients. Featured Products: Kelly’s Spa is committed to enhancing your health and wellness by employing natural and organic products including Kelly Roberts Fountain of Youth Signature Skin and Body Collection. We also offer HydrFacial, NuFace & NuBody, Eminence Organics, Intraceuticals, Life Line, Kerstin Florian, Epicuren, Pure Fiji and Vita Liberata. The hotel occupies an entire block in downtown Riverside, CA. Visit Kelly's Spa at The Mission Inn and follow them on Instagram at @kellys_spa.